Newton St Cyres is a village, civil parish former manor and former ecclesiastical parish in Mid Devon, in the English county of Devon, located between Crediton and Exeter. It had a population of 562 at the 2011 Census. The village is part of the Newbrooke electoral ward. The ward population at the above census was 1,520. Almost destroyed by fire in the early 1960s, its main point of interest is the Parish Church, built in the 15th century and dedicated to the martyrs St. Cyriac and his mother St. Julitta. Most of the church is in early Perpendicular style, built of local reddish 'trap', a volcanic stone from quarries at Posbury, with the exception of the nave pillars, which are of Beer stone. It contains the monument with standing effigy of John Northcote (1570-1632) of Hayne, lord of the manor of Newton St Cyres. Newton St Cyres railway station serves the Exeter to Barnstaple line. Newton House, built circa 1770 by John VI Quicke (1724-1776), (i.e. "the 6th"), Sheriff of Devon in 1757, whose monument survives in Newton St Cyres Church. In 1810 his son John VII Quicke (1759-1830) of Newton House, was lord of the manor of Newton St Cyres. The location of the house was marred by the presence of the busy main-road between Crediton and Exeter, which passed almost next to the house and separated it from the parish church. To ameliorate the situation, at some time before 1797, John VII Quicke employed soldiers returning from the Napoleonic Wars to lower the road by digging out a 50 foot deep cutting, over which he built a private footbridge linking his house with the church yard. Thus the house now appears sited at the edge of a cliff, as is illustrated in a 1797 watercolour by Rev. John Swete. The house burned down in 1906, but was rebuilt in 1909. It was converted into flats and sold by the Quicke family, which in 1967 had abandoned it in favour of nearby Sherwood within the same parish. Sherwood House, built in 1918 by Adrian Cave, to the design of his cousin the architect Walter Cave of Sidbury, in the Arts and Crafts style. It was occupied by the Quicke family, which had abandoned nearby Newton House, from 1967 until its sale in February 2017. The business known as Quicke's Cheeses was established by John X Quicke (i.e.the 10th), using milk from the 2,400 acre estate in the parish still owned by his family. He served as chairman of the Ministry of Agriculture's Regional Board 1972-5. Hayne, ancient seat of the Northcote family, in 1885 elevated to the peerage as Viscount St Cyres of Newton St Cyres and Earl of Iddesleigh. Demolished prior to 1797. 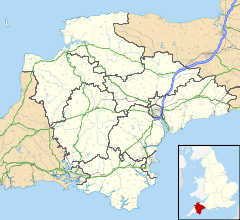 The Northcotes moved to Pynes in the parish of Upton Pyne, Devon. ^ "Parish population 2011". Retrieved 22 February 2015. ^ "Newbrooke ward 2011". Retrieved 22 February 2015. ^ "Settlement Character Part 3" (PDF). Mid Devon District Council. Retrieved 15 July 2016. ^ Date of building per Gray, Todd & Rowe, Margery (Eds. ), Travels in Georgian Devon: The Illustrated Journals of The Reverend John Swete, 1789-1800, 4 vols., Tiverton, 1999, vol.3, p.126 Swete writing in 1797 "somewhat more than 20 years ago"
^ Swete, Vol.3, p.126, 1797, notes the presence of "an under-road excavated from the rock"
This page was last edited on 19 January 2018, at 20:37 (UTC).